Dry winds blow downwards, caressing stark desert dunes before travelling to distant shores across the dramatic oceanscapes along the Skeleton Coast of Namibia. A haunting and evocative coastline, trapping stranded ocean vessels of times long past in yellow white stretches of sand reaches north into Angola and meets rivers running through, across and around spectacular rock formations and towering mountains. Together, these spaces work to support life in this desert world. Stretching along the desert coast of Angola and Namibia, several national parks, reserves, conservancies and tourism concession areas on both sides of the border form the Iona-Skeleton Coast Transfrontier Conservation Area, encompassing a total area of 47,698 km2. In Angola the Iona National Park is found in the Namibe Province of Angola, 200km from the city of Namibe. It is Angola’s oldest and largest National Park (NP), covering 15,150 km2. The Namibie Partial Reserve, covering 4,450 km2, lies to the north of Iona National Park separated by a narrow strip of occupied land along the Curoca River. In Namibia, the Skeleton Coast National Park is located in the north-western part of the country and extends from the mouth of the Ugab River to the Kunene River covering a total area of 16,845 km2. Skeleton NP is approximately 500 km long and 30-40 km wide while the marine component of the park is only 1 km wide. Namibia’s Skeleton Coast National Park adjoins Angola’s Iona NP at the Kunene River. To the east of Skeleton Coast NP are a number of conservancies and tourism concessions. Negotiation processes towards formal establishment of the TFCA started in August 2003 by signing of the MOU. Recently TFCA developments received a new boots by endorsement of the draft Treaty by the Governments of Angola and Namibia. The Presidents of both countries plan to sign the Treaty by November 2016. This TFCA has much to contribute in terms of conservation, especially as regards migration of species across the region, the improved protection of the Kunene River and ecosystem, and shielding of the Welwitschia mirabillis plants. Iona NP and the Skeleton Coast NP both occur in a desert biome that includes the Namib Desert. Annual average precipitation is approximately 18mm. The TFCA is characterised by wild dunes, vast plains, and rough and cliffy mountains. The Skeleton Coast NP is rich in minerals, including diamonds and other gemstones. The Atlantic Ocean forms the Western border of the TFCA with the cold Benguela current bringing much marine diversity. The shoreline is dotted with shipwrecks and is inaccessible to most tourists. Natural springs sustain the desert biome while the great Kunene River is an annual river that forms a border between Angola and Namibia. Sand dunes and dune hummocks, important for coastal biodiversity, are home to a variety of invertebrate and vertebrate species, including at least 90% of the world population of Gerrhosaurus skoogi, the world’s largest herbivorous lizard. 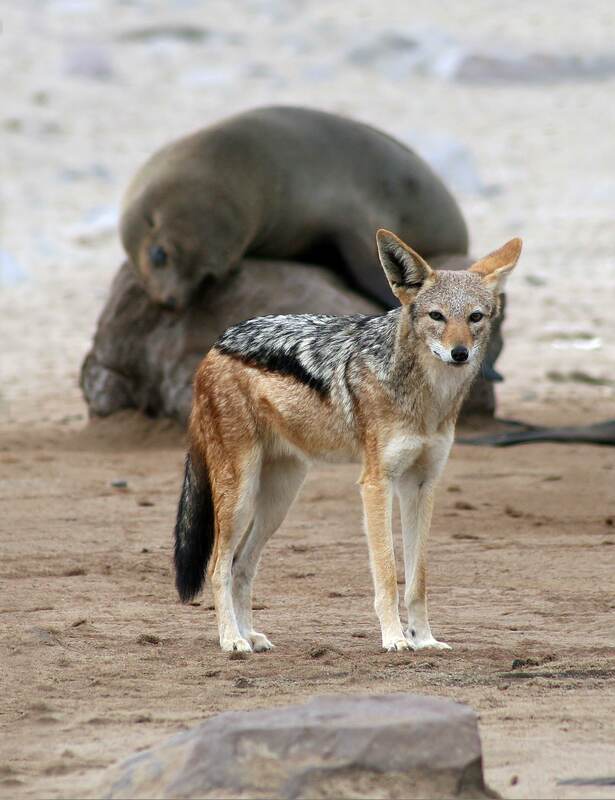 Both the Skeleton Coast NP and Iona NP have several similar species known for their uniqueness, including black-faced impala, desert dwelling elephants, the desert lion, black rhinos and the remarkable Welwitchia mirabilis plant. This plant can live for thousands of years in extremely harsh desert conditions. On the coast line flamingos, pelicans, seals and jackals are regularly seen. Also the endemic Damara Tern and other endemic bird species breed on the beach. Despite the fact that the two parks have a similar ecosystem the status and distribution of many species is largely unknown in Angola’s Iona National Park due to a three-decade civil war. With the establishment of the TFCA, reintroduction of historically occurring species such as giraffe, mountain zebra, black-faced impala, hippopotamus and roan antelope, are being planned. It is hoped that through the range expansions, rare and endangered black-faced impala will also return to areas they historically occurred. With increasing prey densities, predators are also slowly moving in the Angolan component of the TFCA. Recently a survey confirmed the return of the cheetah to the Angolan component of the TFCA. Climate change poses several challenges to the area. One of the challenges is declining fish species due to rising ocean temperatures. Off road driving and therefore access to the park is another challenge, limiting the amount of income generated through tourism into the area, and impacting on revenue streams to support implementation of climate change adaptation and mitigation strategies. Since the establishment of Angola’s Iona National, the area has been home to a population of nomadic tribes, whose main activity is livestock farming. With a low density population in the TFCA, and little viable agricultural land or industry in surrounding areas, Namibia’s Skeleton Coast National Park has little community engagement and communities receive living adjacent to the park receive no direct benefits from the National Park. Community involvement is only in conservancy areas that are managed outside the NP and under the Namibian Ministry of Environment and Tourism. 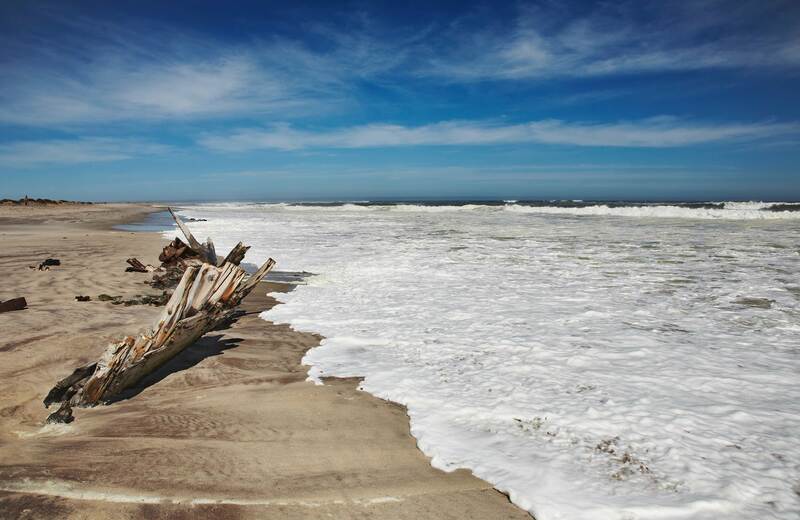 In terms of sheer pristine beauty, the Skeleton Coast has few rivals. Remnants of old shipwrecks, whale skeletons and shelters of early inhabitants and explorers who struggled to survive the inhospitable coastline are the source of the region's frightening name. Given the vulnerability, variety and importance of the landscape and the life it supports, the entire Namibian Skeleton Coast National Park is zoned as either acutely sensitive with a high conservation value or managed for conservation and controlled tourism. In its current state, the ecological importance of the park to sea creatures as a sanctuary and to wildlife as a corridor for movement in a hostile setting is critical. Uniquely, the northern section is only accessible by airplane, while the southern section is open to those with 4-wheel drive vehicles, and is accessible as far as the Ugab River gate. Increased co-operation between Namibia and Angola in developing the Iona-Skeleton Coast TFCA may lead to the establishment of a much larger TFCA spanning three countries along the Namib coast. This would be known as the Three Nations Namib Desert Transfrontier Conservation Area (TNND TFCA), and would include the /Ai-/Ais-Richtersveld Transfrontier Park in the South of Namibia nd the Northwest of South Africa, the proposed Namib-Skeleton Coast National Park (NSNP) in Namibia. The NSNP would be the eighth-largest protected area in the world, and the sixth-largest protected area and largest park in Africa, covering 107,540 km2. It would consist of the current Sperrgebiet National Park, the Namib-Naukluft Park, the proposed Walvis Bay/Swakopmund conservation area, the National West Coast Recreation Area (upgraded to National Park status), and the Skeleton Coast Park. A new Marine Protected Area borders the proposed NSNP and several private game reserves and communal areas would add a further 140,000 km2 of conserved land and sea.